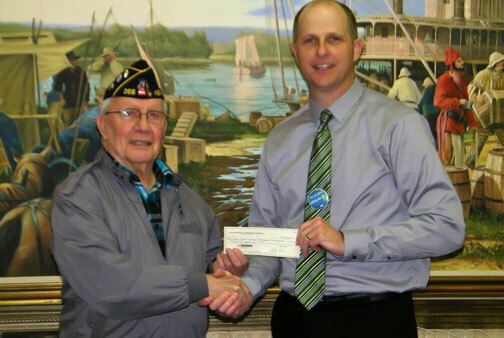 John Peirick of the New Haven American Legion Post 366 presents a check to Track Committee Member David Engelbrecht. NEW HAVEN, Mo. 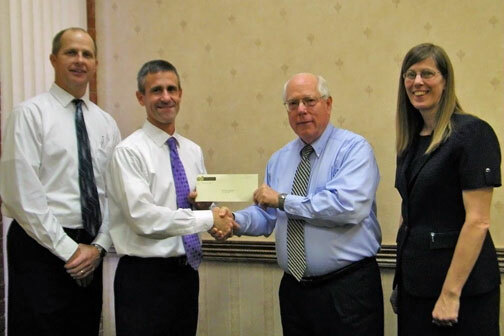 - New Haven American Legion Post 366 made a $500 donation toward the fundraising efforts to construct a new 400 meter track facility on the New Haven School District Campus. The amount of funds committed to the New Haven Community Track Project as of March 26th are $182,000 and well over half of the goal set of $350,000. Danielle Anderson, President of the Town and Country Women's Club, presents a check to Tracy Langenberg, representative of "Keeping Our Tradition on Track". New Haven, Mo. 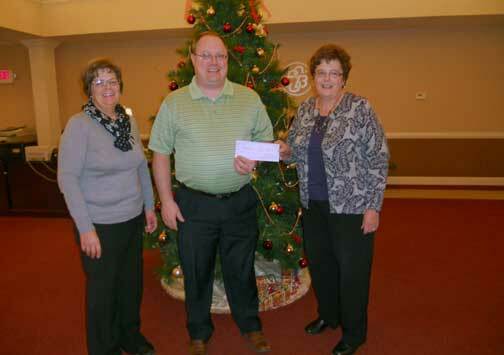 - The Town and Country Women's Club has committed $2,500.00 toward the fundraising efforts to construct a new 400 meter track facility on the New Haven School District Campus. New Haven, Mo. 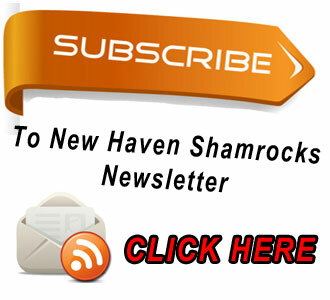 - Since holding a town hall meeting on November 21, 2013 after members of several local businesses and New Haven High School alumni joined forces to form “The Committee to Build a New Track” over 97 individuals and businesses have committed a total of $161,277. In two months nearly half of the estimated $350,00 have been raised and a testament about how NHHS alumni, area businesses, and the New Haven and surrounding areas consistently support the New Haven School District. Below Bob and Peggy Borcherding become first Silver Level Sponsors. New Haven, Mo. - Peoples Savings Bank (PSB) has committed $15,000 over the next three years ($5,000 each year) towards the New Haven Track Project. Tracey Langenberg and David Engelbrecht, Committee Representatives for "Keeping Our Tradition on Track" accept the first "Shamrock" donation from Nadine Pruessner and Gary Kuhn, both of Citizens Bank. 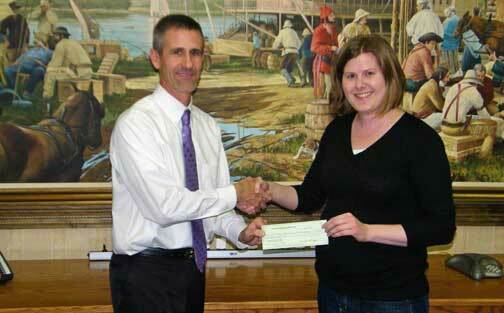 Citizens Bank has pledged $15,000 to help fund a proposed 400 meter track on the New Haven High School Campus. 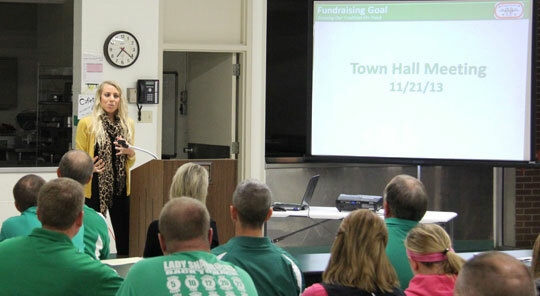 Guest speaker and former New Haven Track star Laura Brandt Miller addresses over 50 people at Thursday's Town Hall meeting. Juia McIntyre pictured with her gold medal after winning the 11-12-year-olds 3000m run. Columbia, Mo. - Stony Hill could very well be home to the next Steve Prefontaine of women's distance running. 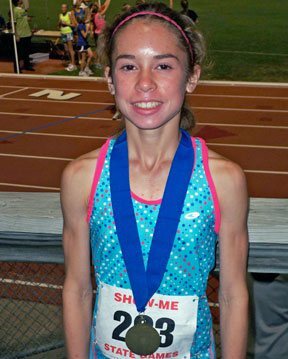 At this summer's Show-Me State Games Franklin County R-II's seventh grader Julia McIntryre was the gold medalist in the girls 11-12 year old division in the 3000m run, finishing with an impressive time of 11:58.9. Seth Schenck (on left) makes his move, leaving the rest watching him win the 800 meter in record time. Jefferson City, Mo. 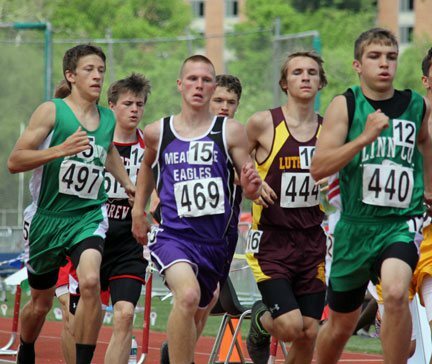 - Saturday at the Class 1 Missouri Track and Field State Finals, Seth Schenck proved he really is a beast, Dominick Pataky went nuts in the 3200-meter-run, two school records were broken, and next year watch out for New Haven’s girls team. Hannah Pruessner, Taylor Covington, Kierstin Monzyk and Molly Munsinger just realized they had ran a 4:07.37. Jefferson City, Mo. 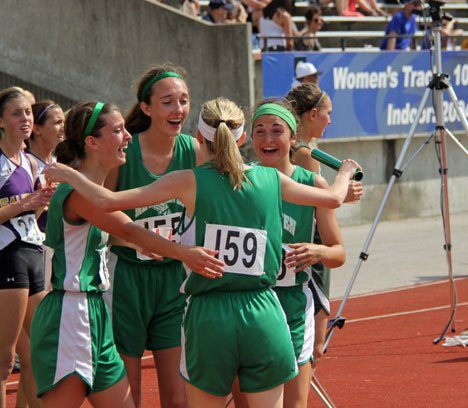 - “Speechless” was how Coach John Tucker described his feelings after watching the girls 4x400 meter relay team, Hannah Pruessner, Kierstin Monzyk, Taylor Covington, and Molly Munsinger, shatter the school record by five-seconds, break the state record, and finish second on Saturday at the State Track Meet. After winning their heat on Friday, New Haven watched as Midway set a new Class 1 record with a time of 407.91, breaking Rock Port’s record of 409.55, which was set back in 1991.